Rab’s Country Lanes staged its Battle of the Schools Tournament on New Year’s Eve with a new twist, and by all accounts it was a big hit. The event, the brain child of Terri Hart 15 years ago, usually brings together squads from the current high school teams to face one another. This year, someone suggested the folks at the Dongan Hills Center should add an Alumni Division. “This (alumni) event came together really quick,” said Country proprietor Frank Wilkinson. “Michael Ruffe, a St. Peter’s alum, brought up the idea during bowling in the Scratch League a few weeks back. Bowlers came out to bowl today for fun, some who haven’t picked up a bowling ball in quite some time. Some former high school bowling standouts, and some who didn’t bowl for their high school. When the smoke had cleared in the Alumni Division, which featured 87 bowlers competing on 18 teams representing 14 high schools, team Tottenville No. 1 emerged victorious. 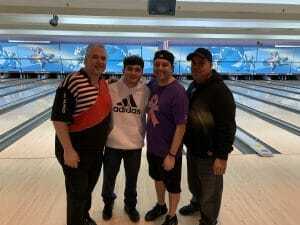 The team consisted of Mickey Endress (’03), Vinny D’Ambrosio, III (’87), Lonnie Levy (’93) and Vincent Schneider (’18), who combined to knock over 3,399 pins in the 15-game Baker format event to win the $1,000 top prize. They beat out St. Peter’s HS Boys No. 1, which felled 3,324 pins. The team consisted of Steve Basile (’06), Keith Wunderlich (’03), Steve Bonanno (’09), Chris McNichol (’07) and Stephen Ennis, Jr. (’06). The 14 high schools represented were Tottenville, St. Peter’s Boys, St. Peter’s, St. Joseph by-the-Sea, S.I. Tech, McKee, St. John Villa, Curtis, Susan Wagner, Fort Hamilton, St. Joseph Hill, Monsignor Farrell, Port Richmond and New Dorp. 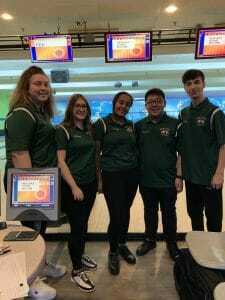 In the high school division, New Dorp claimed the crown by knocking over 3,031 pins. The team consisted of Giselle Rau, Allison Everts, Maya Avilez, Brandon Leung and William Courtney. 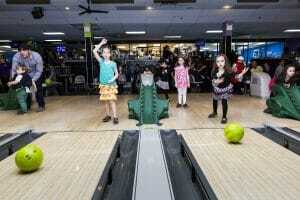 The winners beat out defending champion Tottenville, which felled 2,947 pins. Wilkinson said all monies raised is being donated back to the represented school’s bowling program. A total of $1,500 was awarded with funds matched by the Rab Wilkinson Foundation. 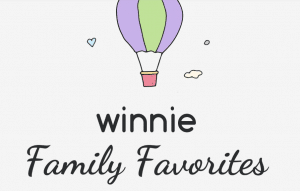 Voting is open for the 2018 Winnie Family Favorites and your favorite place to go bowling has been nominated in two categories! CLICK HERE to vote for us in the Best Birthday Party Venue and Best Indoor Entertainment categories! Vote often… You can also vote for your other local favorites like the Staten Island Zoo or Staten Island Children’s Museum! Join A Fall Bowling League at Rab’s! At Rab’s Country Lanes, we love bowling! From our perspective, bowling pushes us as individuals and as teammates to do better and reach further. And if you’re like us, you probably can’t get enough time at the lanes either! Luckily, our fall bowling leagues are open! Bring your whole team down and get ready or find an open spot on an existing team. Either way, you’ll have a chance to step up your game starting this September in a fun league that matches your skill levels. Our fall/winter leagues run from September through May and offer a bunch of different options to fit anyone’s preference or ability level. Check out the different types of leagues we’re offering this year and give us a call to find out more! 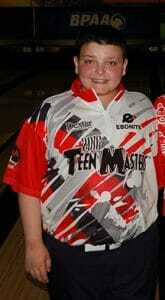 Maybe it’s been a while or maybe you’ve always liked bowling but just haven’t spent that much time doing it. Our leagues don’t start for another month or so and we always have an open lane for you. We’re more than just a bowling alley, though! We also have a host of other fun activities such as an awesome snack bar, a wicked laser maze, and our high roller’s lounge! And don’t forget to visit our pro shop for all your gear before league play starts up! At Rab’s, we know how to have fun. Come join a league this fall and see what it’s all about! The final qualifying round of the 2018 Junior Gold Championships concluded Thursday with the final 4 games of competition. Anthony Mastroianni lead the group of competitors from Rab’s with a 3045 16-game series and a 57th place finish in the U15 Boys Division. He will advance to Friday’s Advancer Round. Maya Avilez fell just 5 pins shy of the Advancers Round, finishing with a 2773 total and a 59th place finish in the U15 Girls Division. Below is a recap of all of the competitors from Rab’s who competed this week. Congratulations to all on a fantastic week of competition. Stay tuned for more as Anthony continues his quest! After a loss in the USA Bowling Northeast Regional Tournament finals held in December at Rab’s Country Lanes, Mel’s All Stars; a team comprised of Joseph Guarnieri, William Kohnenkamp, Brianna Mester, and Ashley Weisenstein, w/ Coach Melissa Kammerer; was determined to advance to the National Finals. The team then made the trip to the New England Regional Tournament in Rhode Island, where they eventually found themselves crowned the U12 Champions and headed to the National Finals in Dallas, TX. 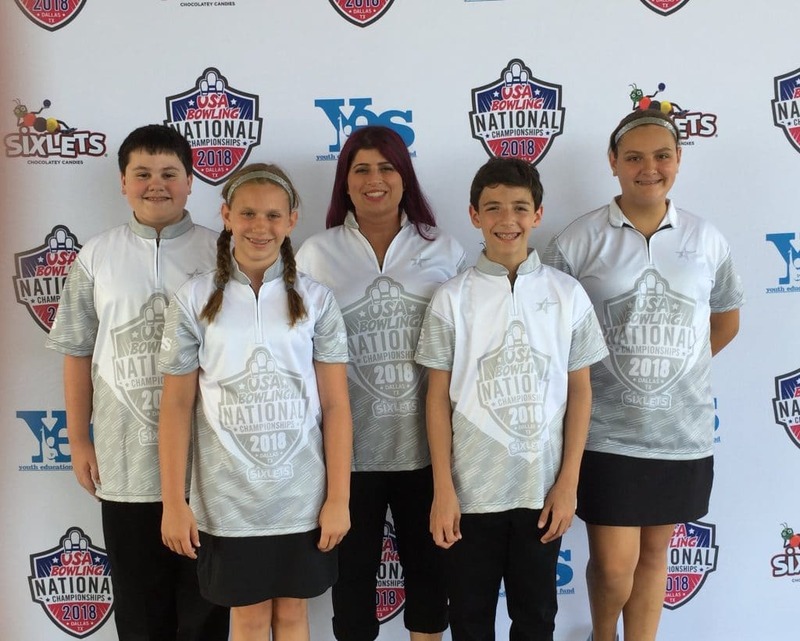 The 2018 USA Bowling National Championships, sponsored by Sixlets, features the top 12-and-under (U12) and 15-and-under (U15) youth teams competing for a national title. The 14 U12 teams and 16 U15 teams earned their spots in the field by winning a regional event. Day 1 of competition included a Round Robin Format where each team bowled a total of 13 matches head-to-head against each other. Teams in the U12 division bowled 13 Baker matches Wednesday at AMF Garland Lanes to determine seeding for Thursday’s double-elimination bracket, while teams in U15 bowled 15 Baker matches. A team’s match-play record in qualifying determined its seeding, with total pinfall breaking any ties. Mel’s All Stars finished the Qualifying Round with a 6-7 record, for a 10th Place finish headed into the double-elimination bracket finals. Off to a slow start, they lost the first match by 4 pins (181-185), won the 2nd by 18 (198-180) and then finished off with a bang winning the 5 of the last 7 games. The double-elimination portion of the event was contested Thursday at nearby USA Bowl. Bracket matches were contested in a best-of-three Baker format. After a great start in the Winners Bracket, the team representing the Southwest handed Mel’s All Stars their first loss, the Southwest continued their run and eventually made their way to the televised Finals. Day 3 of the Qualifying Round at the Junior Gold Championships in the books. One more day of qualifying continues tomorrow with the final 4 games before the field will be cut for the next round of competition. Anthony Mastroianni continues to lead the pack of bowlers, having moved up to 19th place in the U15 Boys Division after a great 796 set on the lanes. Maya Avilez is holding her own in the U15 Girls Division, staying close to the cut line. After a consistent set of 180 games, Maya found herself moving up 1 spot in the standings to 33rd place. William Courtney found himself jumping up 58 spots to 984th place out of 1495 Boys in the U20 Division, after rolling a 223 game to round off his third day of qualifying. Christopher Riordan pulled out of competition due to an injury on the second day of qualifying, we wish the best to Christopher on a speedy recovery! Good Luck to all on their last day of qualifying competition! Qualifying Rounds at the Junior Gold Championships in Dallas, TX continued yesterday where 21 youth bowlers from Rab’s continued their journey. Anthony Mastroianni, in the U15 Boys Division, leads the pack rolling an 818 series on Day 2 for a 1593 8-game total, where he currently sits in 31st place our of 672 competitors. Brandon Leung, not too far behind in 81st place rolled 790 to an 1524 total. 96 bowlers in this division after the 16 games of qualifying will advance to the Advancers Round. Maya Avilez added a 644 series to her qualifying round scores, after ending Round 2 with a huge 248 game, keeping her in the hunt to advance to the next round in the U15 Girls Division. Brianna Mester and Joseph Guarnieri are keeping pace in the U12 divisions. Joseph started day 2 off with a 236 game while Brianna rolled a 689 series to add to her total. Best of Luck to all the athletes as they compete this week! Stay tuned for updates as competition continues. Bowlers will bowl 16 games in the Qualifying Round before the Advancer Rounds. 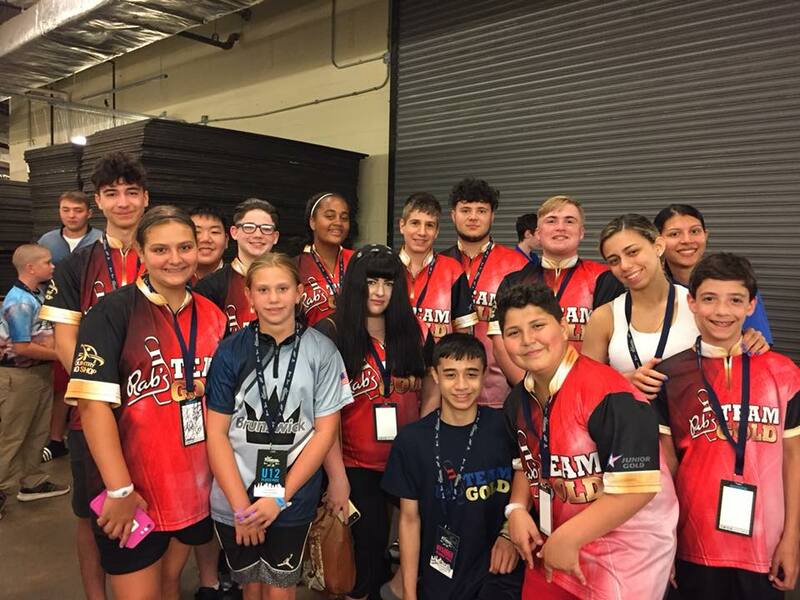 Staten Island is represented by twenty youth bowlers competing in Dallas, Texas July 16-21 at the USBC Junior Gold Championships. Almost 3,900 youth bowlers, the highest number in the event’s history, will compete for the elusive titles, spots on USBC Junior Team USA 2019 and more than $350,000 in scholarships. 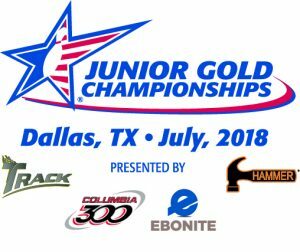 The 21st edition of the USBC Junior Gold Championships will take place in 9 bowling centers in the Dallas/Fort Worth Area. The event features top USBC Youth bowlers ages 7 to 20 from around the United States as well as Canada, Puerto Rico and U.S. military zones. Each participant qualified to enter by advancing through local USBC Junior Gold qualifying leagues and tournaments. The event started Saturday with a Trade Show and Athlete Registration and then an Opening Ceremonies celebrating the young athletes who were then treated with a performance by Light Balance of America’s Got Talent fame. Competition officially started Monday July 16th, when bowlers bowled 4 games. Competitors will bowl 16 games in the qualifying rounds before advancing to the Advancer Rounds and Finals which will be televised on CBS Sports Network. Bay Ridge altruist and manager of the Hearts Connected Group, Donna Russo-Lubrano, is hosting an exciting bowling fundraiser this weekend in memory of her oldest sister. The fundraiser will take place on July 15, 2018 at Rab’s Country Lanes (1600 Hylan Blvd. on Staten Island) with check-in at 1 p.m. 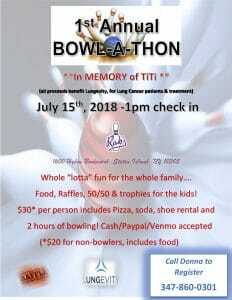 The event asks for a $30 donation, which includes pizza, soda, shoe rental and two hours of bowling, or a $20 donation for non-bowlers which includes food and drinks. Teresa A. “TiTi” Favret, who passed two years ago from lung cancer, was beloved by her family and community. Even though she resided in Mount Kisco, New York, she was a longtime Bay Ridge resident before that and still drove the few hours to Dyker Heights to get her hair and nails done with her sister. Russo-Lubrano’s daughter, Angelia, has also taken up bowling in two different leagues as a dedication to her aunt’s favorite pastime. Russo-Lubrano has participated in the signature walking fundraiser for the American Cancer Society, “Relay For Life,” for 15 years. Though, she said, the last two years were especially hard for her without her sister (she could not participate), which is why the proceeds for the bowling event will go towards lung cancer patients, their treatment and the LUNGevity Foundation. Russo-Lubrano reached out to the foundation for support because they are committed to making an impact on people with lung cancer and fighting the disease like her sister had. LUNGevity will be participating in the event, as well as a bevy of local businesses from both Bay Ridge and Staten Island who have signed on as sponsors. These businesses will be donating everything from free handouts and desserts to prizes and raffle baskets. Business donations so far include Italianissimo Ristorante, Nino’s Restaurant, Harde’s Liquor Store, the Maxx Challenge, Malsons Jewelers and Staten Island FunPark. Don’t Miss Out on Rab’s Summer Kids Special! The weather in Staten Island is constantly fluctuating. One day it’s burning hot and the next day it’s pouring rain. Your kids may be getting a bit stir crazy … and school is still one month away! Fortunately, we have the answer to your family entertainment woes. 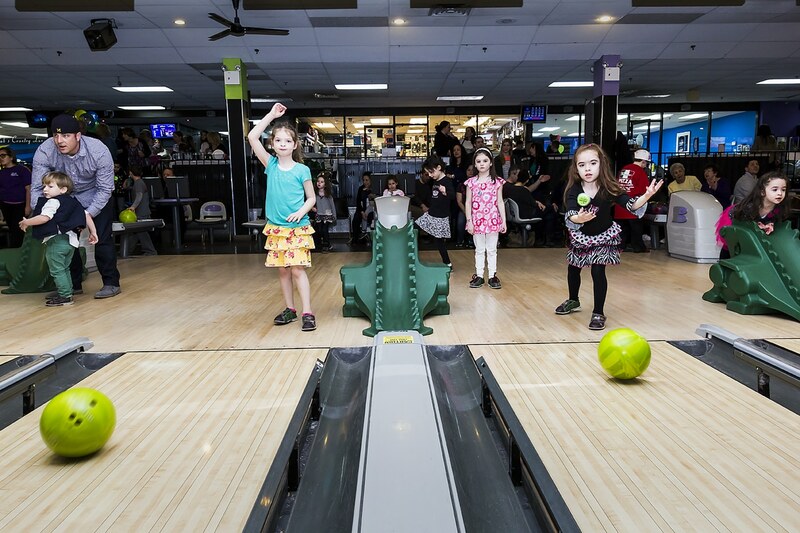 You and your kids can enjoy one of the best activities in Staten Island: bowling! And, to make it better, we are now running a Summer Kids Special that is affordable and fun. For your toddlers and teenagers, this is a great family outing. Speaking of family outings, we don’t want parents to miss out on the fun either. That’s why we’ve created a special just for you, too! 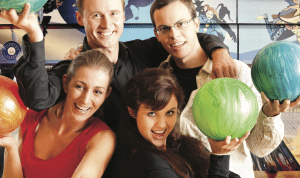 For only $15 per adult, you can enjoy two games of bowling and shoe rental. Please note that the kids and adults must share the same lane, and this deal is only available with the purchase of the Summer Kids Special. This great deal is available for up to six bowlers per lane. What are you waiting for? Invite your favorite five people and head to Rab’s Country Lanes for hours of endless fun! Contact us with questions.